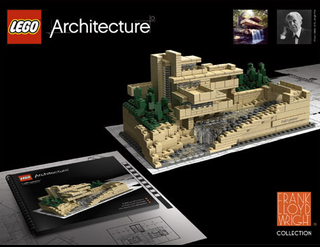 I love Lego's Frank Lloyd Wright Collection has a mini model of the Guggenheim Museum in NYC, but I'm more in love with the model of the Fallingwater house built over a waterfall. The real house sits 50 miles from Pittsburgh, and although it looks as if it belongs in the future, it was constructed around 1935. The house has always been one of those fantasy homes of mine, I suppose because it is in the woods, but also close to water. (Two of my favorite things, in theory.) A shame we can't all live somewhere so interesting. Here's a video of an unofficial replica built by a fan, long before this kit was put into production.